School is out and winter is just settling in – are you going stir crazy yet? Here’s the good news: there is plenty to do in Wichita when it’s too cold or too dark to be outside. We have lots of indoor attractions and activities, many providing hours of family fun at an affordable cost. The next time you’re looking for something to do inside in Wichita, consider these options for museums, escape games and unique movie theaters. 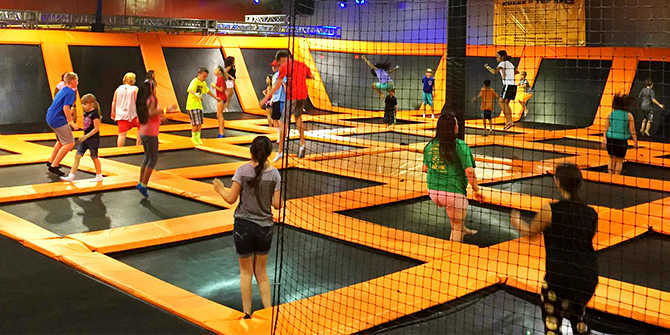 See our post “Where to find indoor fun in Wichita Part 2” for more active indoor pursuits. Our interactive science center, Exploration Place, has three national traveling exhibits ending in early January – Human Plus: Real Lives + Real Engineering, Genome: Unlocking Life’s Code and Eat Well, Play Well – and several new ones opening in late January and early February. They also have the Boeing Dome Theater and Planetarium with daily shows. Kansas’ largest art museum, the Wichita Art Museum, is always free on Saturday! The museum has several temporary exhibitions running, including “386,552: Art for Wichita.” Named for the 2016 census-bureau population of Wichita and showcasing the art and artists that have helped shape the city, “386,552” is on display through Feb. 19 and includes objects from the museum’s permanent collection as well as a rotation of current local artists. For 25 cents, visitors can purchase reproductions of the local artists’ work from two art-vending machines. Check websites for current exhibits and discount admission days. Use your creativity for an hour of fun, teamwork and excitement as you find clues and solve puzzles to escape one of three rooms at Wichita Room Escape – The Mission, The Barber Shop and The Autopsy. Two of the rooms allow eight players, one allows six. You can book an entire room and time slot for your group, or purchase the tickets you need and be paired with other players. You can book as early as 30 days before your game or as late as the day you want to play; walk-ins are allowed but there is no guarantee of availability. Plan to be there for about an hour and 20 minutes, including the briefing and debrief. Wichita Room Escape is offering 10 percent off any bookings on Dec. 31 and time slots are available between noon and 8:40 p.m. If you’re a family of movie aficionados, then the high-end Warren Theatres are where you want to be. Get a bite at the Warren Diner out east before seeing a movie in their grand auditorium, or if everyone in your group is 21 years or older buy tickets in the Warren 21 section and enjoy reclining, heated seats and individual armrests, reserved seating and an expanded bar and food menu. View a blockbuster on one of the largest IMAX screens in North America at the west location. The Warren Oldtown is the only all-digital theater in Kansas that serves food inside the theater so you can enjoy a premium movie experience without leaving your ultra-luxurious high-back rocking chair (must be 18 and over after 8 p.m.).